SAL DeTRAGLIA'S VIRTUAL TAPAS BAR: THE TECHNICOLOR WEB OF SOUND! CAN YOU DIG IT?! 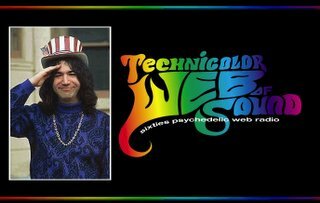 THE TECHNICOLOR WEB OF SOUND! CAN YOU DIG IT?! Spain has many positive attributes, but its music isn’t one of them. Try as I might (and admittedly, I haven’t tried very hard), I’ve acquired neither a taste nor a tolerance for the schmaltzy Latino pop or barking flamenco that blanket the Iberian airwaves. So for the past six years, my ears have had just one humble request—Psychedelia. Just a little taste of Moby Grape! Or a smidgen of Electric Banana! Or even a few bars from Ant Trip Ceremony! And then—just when I’d resigned myself to a lifetime of misery at the bile-churning vocal chords of Enrique Iglesias—I found it! The holy grail of late ‘60’s psychedelic music! And it was sitting there all along in my iTunes software. I’m talking about...THE TECHNICOLOR WEB OF SOUND! 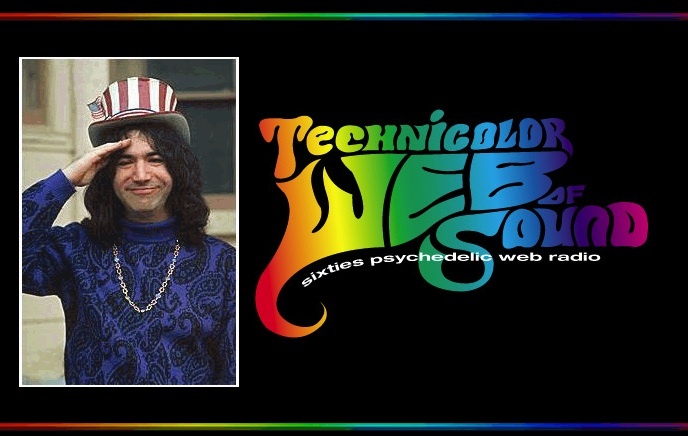 Technicolor Web of Sound is an Internet radio stream—originating somewhere in the US midwest—that plays the widest, grooviest, most far-out selection of ‘60’s psychedelic music I’ve ever heard. - Then click on the “Classic Rock” category and wait for the menu of streams (about 23 of them) to drop down. - There! At or near the bottom of the list, you’ll find the TWofS stream. Click it! Dig it! Live it! I have been deafened by the sound of bagpipes ... based on that, I'm not sure I trust your taste in music anymore. I'm on it! It's playing right now. Wait. Wait. OMG - it's a 4-H commercial. Never heard one of those. Karl-baby: I'm on it, too. Hell, I'm alway on it lately. I heard that 4H commercial (from 196?). TWofS does that a lot. They've managed to score a bunch of old radio commercials from the '60's and intersperse them between songs. They seem to like concert promotions (Moby Grape playing at the Fillmore, etc.) and anti-drug propaganda. Let's see what song is playing now. "The Day of the Change" by Andromeda. Ever heard? Me neither! That's what I love about this stream. The go way, way beyond the ubiquitous Jimi Hendrix and Syd Barrett-era Pink Floyd and manage to scrounge-up hidden gems of psychodelia that you could only find at an estate sale. Lady Di: Are you honestly telling us that you don't like bagpipes? Well then...stop by the TWofS and we'll swap those pipes for a sitar. Now...'scuse me while I fluff-up my afro. I don't understand the TWofS ... I was trying to cover this fact. Sounds scary ... and like the haggis bashing, I'm dragging my heels. Ran tonight, despite extreme weather, impressed my running coach even ... I'm getting quite marvellous, writes the modest one, ably assisted by a spanish red. You run?! You're one of us?! Yeah!!! Wait a minute. You have a running coach? What does a running coach do? Presumably, you knew how to run before you hired him. Q: "Why do those people walk so much faster than me?" A: "They're not walking. They're doing something called 'running.' I'll teach you how to do it for5€ per hour." Anyway, perhaps you won't appreciate TWoS. To be honest, it's probably a guy-thing. Besides, there's a generational factor. I was born during the Summer of Love...so this *my* music. I wanted to go to Woodstock, but had problems hitchhiking. Nobody wanted to give a ride to a 2 year old. At least you've tried Haggis Bashing. Sorry... but doesn't everyone hate bagpipes?? Personally I would have a worldwide ban on them, with the exception of the highlands of Scotland! If you want to hear/play them, then you have to go there! Bagpipes?? That's taking freedom of speech (freedom of screech! )too far! Running coach ... well a friend invited me to come running with her ... her son's running coach was charging a one off payment of 20euro for 10 weeks, 3 times p/w and ... at the end of it he promised we'd be running 5kms. TWoS and generational thing ... hmmmm, okay let's leave it like that. When I was at university in Victoria, B.C., every year on Robbie Burns Day an unknown Scotsman would dress up in full regalia and stand on the roof of some building or other and treat us to a serenade. I was born four summers before the Summer of Love, but I doubt they would have let me go to Woodstock either. Must check out this Technicolor Web thing. Bring on the Pink Floyd! When was the Summer of Love????? Am I the only one in the world not to know? Lady Di: You realize that by answering your question, I'll be divulging my age...eh? That's just fine with me, as I do believe you might be thousandsssssssssss of days older me. I think I read it somewhere ... can't find it now. As I pressed post, I saw the 1967 at the bottom of your comment. Damn damn damn ... well, I'll go now she writes, slinking off. hee hee... I'm so amused by this entire thread. Electric Banana? Moby Grape? What?? Maybe you call can educate me. As soon as my laptop gets fixed and I can again waste hours aimlessly surfing the web. This brings to mind the recent "news brief" on my Page-a-Day calender of "The Onion" -- "Son surprised dad knows Johnny Cash song"
IOWA CITY, IA -- Shawn Sullivan, 22, was stunned to learn Monday that his father is familiar with the Johnny Cash song, "I Walk the Line." "Where the hell did Dad learn that?" asked Sullivan, whose father recognized the song playing over speakers while dining out with the family. "That's, like, something me and my friends listen to." Sullivan conjectured that, while borrowing his father's car recently, he must have inadvertently left the radio tuned to KRUI 89.7, the local college radio station. Wow! I'm amazed! Do you guys actually play bash the haggis with the sound turned up??? Actually, I've noticed that the bagpipe fans are the ones that are very good at it? Mmmmmmm.....?? This week it's Johnny Cash. Next week it will be Sly and the Family Stone. One thing's for sure. I won't be singing any Mariah Carey tunes when my daughter is in high school. Take trip along the TWofS. You might dig it. Fer sure your boyfriend will like it. I just sing to myself in the bathroom. Maybe I should start my own internet station, named Bathroom Diva. Will you listen to my station too Sal? I'm going to go work on my repertoire now. WE ARE IN THE PRESENCE OF GREATNESS! LET'S PLAY "BASH THE HAGGIS!"